I've found the more I create cards, the bigger my stash gets, the more videos I watch and the more blogs I follow, that I tend to try to stay within one brand for my cards. Each card, from start to finish is either all Lawn Fawn, or all MFT or all Clearly Besotted etc. And that's all well and good, and maybe if I'm lucky enough to be a guest designer or (dare I dream) on one of the design teams that habit will serve me well. As of right now, though, I'm not. I remember way back when I first started it didn't even occur to me to stay in the same brand for a whole card. First off, I didn't know that was a thing, and second I certainly didn't have the supplies to do that. LOL We've all been there, right? Today's card is a mash up of two of my favourite companies; Lawn Fawn and Clearly Besotted. To begin, I stamped the rose from Clearly Besotted's "Merci Beaucoup" set with Memento Tuxedo Black ink on 110lb Copic-friendly cardstock. I then stamped the top of the dome from Lawn Fawn's "Ready, Set, Snow" set, masking the bottom. I repeated the process, stamping the bottom of the dome and used a Copic-safe liner and a straight edge to pull the lines together. I coloured the rose and the base of the dome with Copic markers. I then used some of the little snowflakes from the Lawn Fawn set with Delicata silver ink to add the sparkles around the flower. Once that was dry, I prepped the base of the dome with my powder tool and stamped the "Valentine" with VersaMark ink and heat embossed with silver detail embossing powder. To make the dome look a little more like glass and a little less flat, I took my lightest blue Copic marker (B000) and drew a few streaks to create the illusion of reflection. This is a relatively new technique for me and I definitely need some practice, but I think it turned out well for a first try. Finally, to finish off the panel and because I just can't really help myself, I used the Spectrum Noir clear glitter brush pen over the petals. This time I was very careful not to add too many layers (like we saw here, I guess I learned from that mistake!). I had to trim down the left edge of the panel as my images weren't centered, I adhered my panel to a piece of red glitter paper then mounted the whole lot to the front of a standard A2 sized card base. Trina this is a beautiful card, the Rose is coloured with the perfect amount of shading! Thank you for sharing with us at Muse this week! I love this card - the fairy tale reference, the sparkle and the combination of stamps - I loved reading your story because I feel the same way about mixing stamps - I used to do it all the time, now only with an express reason, but it's good to mix it up and get use of all your goodies! Thanks for joining us at Muse this week! Wonderful colouring on the rose. 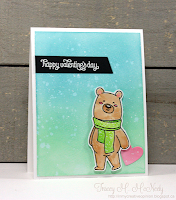 With Sympathy | ft. Stampin' Up "Birthday Blooms"
Bitty Birthday | ft. Mft's "Bitty Bears"